How are spiritual power and self-transformation cultivated in street ministries? In Addicted to Christ, Helena Hansen provides an in-depth analysis of Pentecostal ministries in Puerto Rico that were founded and run by self-identified “ex-addicts,” ministries that are also widespread in poor Black and Latino neighborhoods in the U.S. mainland. Richly ethnographic, the book harmoniously melds Hansen’s dual expertise in cultural anthropology and psychiatry. Through the stories of ministry converts, she examines key elements of Pentecostalism: mysticism, ascetic practice, and the idea of other-worldliness. She then reconstructs the ministries' strategies of spiritual victory over addiction: transformation techniques to build spiritual strength and authority through pain and discipline; cultivation of alternative masculinities based on male converts’ reclamation of domestic space; and radical rupture from a post-industrial “culture of disposability.” By contrasting the ministries’ logic of addiction with that of biomedicine, Hansen rethinks roads to recovery, discovering unexpected convergences with biomedicine while revealing the allure of street corner ministries. Helena Hansen, MD, PhD is Assistant Professor of Anthropology and Assistant Professor of Psychiatry at New York University. 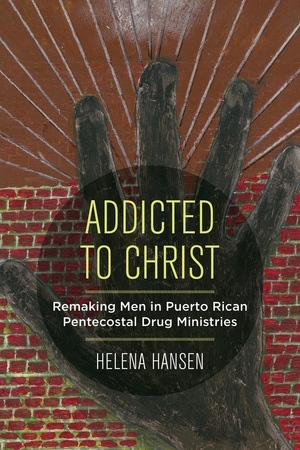 "Hansen has written a deeply empathetic ethnography of the struggle for recovery from addiction in Puerto Rican Pentecostal drug recovery churches. With critical humility and solidarity she also draws from her own hospital-based psychiatric clinical service to produce a tour de force of critical engaged medical anthropology. Plumbing creatively and critically from within her multiple positionalities as a clinician, a social scientist, an African American woman, and the child of a powerful extended matriarchal family touched by the entangled traumas of oppression, mental illness and addiction she is advancing a creative new psychoanalytic and political economic theoretical understanding of gender power relations, family trauma, racialized colonial oppressions, the art of clinical practice and biomedical science, the potential for healing and spiritual social solidarity-- and the relentless brutality of contemporary neoliberalism. "—Philippe Bourgois, author of In Search of Respect: Dealing Crack in El Barrio, and Righteous Dopefiend. “I enjoyed Addicted to Christ a great deal. It is well-written, innovative, salient and it has an important story to tell. "— Arthur Kleinman, MD, author of Patients and Healers in the Context of Culture, The Illness Narratives, and What Really Matters. “This book is an important contribution to our understanding of addiction, as it bridges the fields of anthropology and psychiatry with remarkable insight and scholarship. It is remarkable in that it provides a humanistic approach, one that is so often lacking in how the medical field deals with this major public health problem. "—Marc Galanter, MD, Past President, American Society for Addiction Medicine, author of Spirituality and the Healthy Mind.